I really hate feeling angry about things that I can do nothing about. 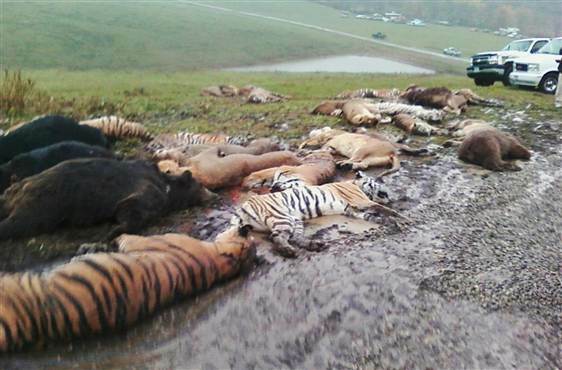 If you read the news then you heard about the story in Ohio with all the exotic animals that were let loose. There was a wild animal preserve in Zanesville, Ohio and apparently the owner decided to let the animals loose and then kill himself. This post isn’t to show my anger for the police officers who had to shoot and kill these animals but for the state, city, county and whoever is running things in the state of Ohio. From what I read, this man who owned the preserve was in trouble multiple times for animal cruelty and just in general for the animals he had on his property vs. certain permits. Police had been there many times and he was known by many. From ABC: Thompson has been warned repeatedly over the last decade to get his animals under control – and no less than 30 times in the past year. He was arrested in April of 2005 for cruelty and torture of cattle and bison he had on his property, according to the website pet-abuse.com. Soooo… he was in that much trouble and yet no one did anything to protect the animals??? Why exactly was he allowed for so long to keep these animals? Why was he permitted to continue buying more?? I really hope that after this mess and hurt and anger it has caused that the state will step up and do something about the laws in place. Personally I don’t think any one person should be allowed to own a wild animal and keep it on their property for any reason. EVER! There are specific places and organizations that can take in and rehabilitate wild and exotic animals. It’s cruel to keep them locked in a cage or pen where they can’t do as nature created them to do. I’m sure I could continue on and on with this but I’d like to hear how you feel. Tell me your thoughts! Share this post, like this post and follow this blog for more! !